Well it looks like I will be changing my crafting to something a little more portable. We have decided to go outside our area for treatment for my husband. So, I will be leaving the craft items and the sewing machines behind and taking only something portable. Time to transfer all the craft items over to our house sitter for a couple of months. In the past, I have dabbled in Crocheting and did like it. 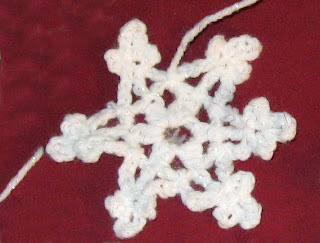 I made crochet stars or snowflakes last year to place on gifts. I think I'll take some of that with me to the hotel. Maybe I can make some for the Christmas trees that will be at the hospital over Christmas. Or, I may become ambitious and make a crochet blanket. In any case, I wanted to show you photos of the Christmas stars I previously made and where you can find a great tutorial. The website where I found these great patterns is called Crochet Mania by Teresa. She has great YouTube videos in the project descriptions that go along with the instructions. Here is the link for Snowflakes I am working on above. P.s. If anyone has any other suggestions for portable crafting, send them along! I did a felted wool table runner during my hospital stint while my husband had knee and neck disk replacements. Easy to do-simple blanket stitch and I used a glue stick. I knit socks so that keeps me busy while waiting. I also knit fingerless mitts by the dozen as they knit up quickly. I should embroider stuff, but haven't done it for 30 odd years. These are beautiful Christmas stars! I really like that; thank you for sharing! !